Picture this: you've got a book under the document camera just above the reading level of most of your students. They are choral reading the book with you and you're stopped by a word covered with a sticky note. The students are eager to figure out that word to see if they are right. You work with the students to use vital strategies for figuring out tricky words and each child has an idea of what that word might be. You slowly peel back that sticky note, read the correct word as whispers of "yes" are heard from throughout the group. Your students are engaged and learning important reading skills. 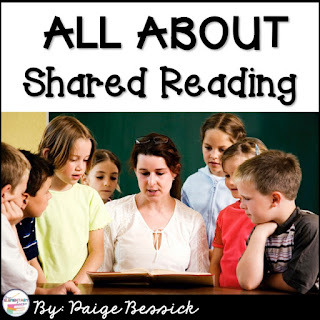 This is shared reading! Shared reading is a necessary activity in all classrooms, especially in primary classrooms. Keep reading to learn more! **This post contains affiliate links from Amazon. By purchasing an item on the Amazon site using these links, I will receive a small commission on your purchase. This helps me to continue writing this blog and providing you with these tips and ideas. Thank you! It is a method of teaching reading that allows for students to be supported while reading a leveled text just above their reading level. It can be used to teach all reading strategies including decoding, fluency, comprehension, and vocabulary. It is an appropriate activity for all grade levels, but should especially be done in the primary classroom. 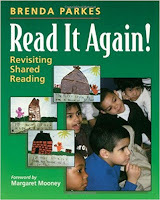 I just got the book Read It Again: Revisiting Shared Reading by Brenda Parkes and have been devouring everything in it. I have a very low group of students this year, so we have been doing a lot (A LOT) of shared reading. This book has been a huge help in giving me ideas and activities to complete while doing our daily shared reading. Essentially, during shared reading, you are reading a book WITH your students as they chime in. You are demonstrating comprehension and word solving strategies and showing them what it looks like to be a reader. Like interactive read alouds and guided reading, shared reading is an important aspect of any balanced literacy program. 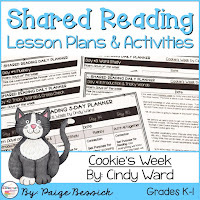 While interactive read alouds support comprehension and provide a fluent reading model, shared reading is an interactive experience where students help you read and learn strategies right along with you. 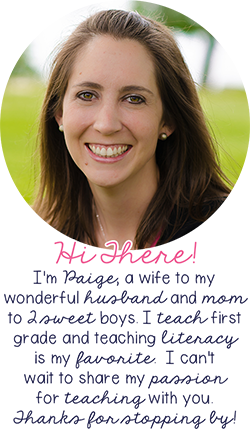 Want to learn more about Interactive Read Alouds? Check out >>THIS<< post! provides struggling readers with the support they need to learn how to read on their own. ensures all students feel successful because you are providing support for the whole group. encourages the teaching and use of comprehension strategies. can build sight word recognition with the use of predictable texts. builds fluency with repeated readings. encourages engaged and active learners. 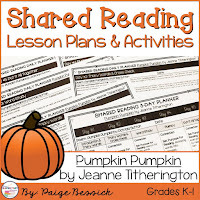 provides learning opportunities for all level readers in your group. teaches students explicitly how to use reading strategies. provides strategies and practice for figuring out tricky words. gives students the confidence to use strategies taught in their own reading. Very rarely do we do things in our classroom that can teach so many skills. Like Interactive Read Alouds, shared reading teaches your students so many different skills with just one activity. I think the most important reason for doing shared reading is it turns your non-readers into readers. After we have read a book for the week, most, if not all of your students will know that book by heart. I typically have several copies of the book we have read and will then give my lowest readers, who I know can read that book after completing all of the activities for a week, the book to add to their independent reading book bag. They feel confident with that book and will often time read that book over and over. They love to take it home and share it with their parents too. The excitement you have created by providing them with the knowledge and practice to read a book, any book, is contagious and will hopefully fuel them to work hard to read even more books. 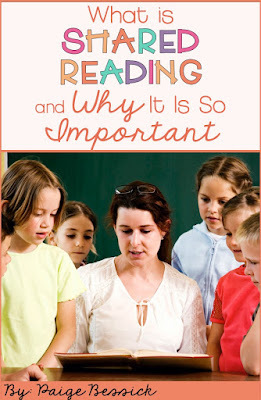 Shared reading is a common practice in my classroom, especially at the beginning of the year. I believe shared reading is so important for our students just learning to read (most of my first graders) that at the beginning of the year, I do it daily. We read a different book every week for the first couple of months. Once most of my students become confident readers on their own (reading books above a level D/E and can sit and read several books in a row), I rotate between shared and interactive reading weekly. The nice thing about shared reading is that each week, the activities for each day pretty much stay the same, just the pre-reading poem, book and words used in the book change. Once we have warmed up our brains with our poem, we dig into the book. Each day during the week, we complete a different activity with the book. Day 1: Build background knowledge, book introduction, start reading, tricky words-echo read. Day 2: Figure out tricky words, discuss important vocabulary-choral read. Day 3: Study sight words or phonics skills-choral read with you dropping out more often. Day 4: Practice for fluency-choral read with you dropping out often. Day 5: Putting it all together with a fun reading or writing activity. Now, each day has a new purpose for reading that book, and I'm not going to go into more detail right now. That will be another post. I do have one more thing to share with you today! As with anything in your classroom, the more prepared you are to teach something, the better it goes. Shared reading is not something you can just wing. You will want to put some thought into your activities and the words you pick. 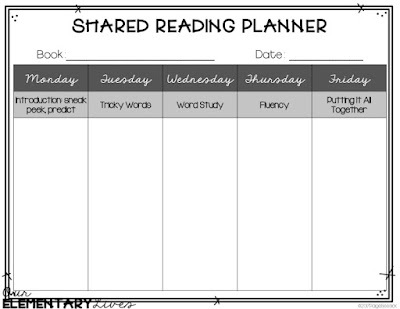 So today, I have a shared reading planner for you. This is the one I use each week and I keep it tucked into the book so I never lose it. Click >>HERE<< or on the picture to get this FREEBIE! 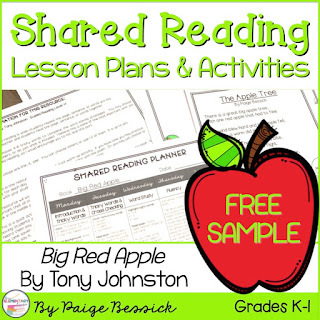 A SAMPLE week of lesson plans for Big Red Apple is included in this FREEBIE. Everything you need along with a writing extension activity and plans is included. Click >>HERE<< or on the picture below. Do you know this book? It's perfect for first graders. Big Red Apple by Tony Johnston. Like I said earlier, this book is just above where most of my students are (probably a level D/E). I also like to have several copies to give to my students after we have completed the activities. They will then add it to their book bag to read during independent time. 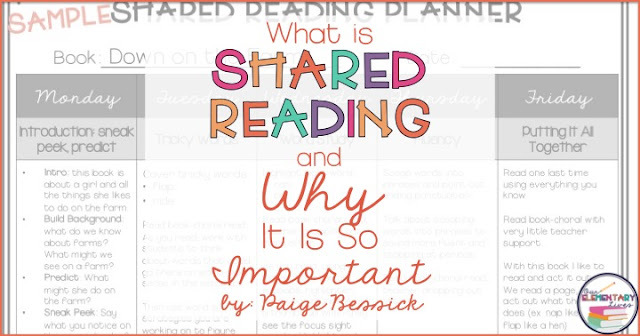 My main focus for this post was for you to understand what shared reading is and why it is so important. Do you do it in your classroom? What books do you like to read? What are your favorite activities? I'd love for you to comment below or email me at ourelementarylives@gmail.com and share with me. If you want to learn more, you can check out this FREEBIE. 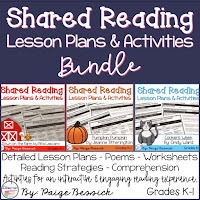 Check out some of my Shared Reading Resources too by clicking >>HERE<< or on the images below. 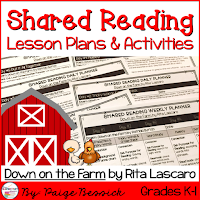 You can also find out more about the shared reading resource: Down on the Farm in a blog post >>HERE<<. As always, if you found this useful, please pin and share for others to see. Stay tuned for another post of what it looks like in my classroom and more activities that you can do each day! Hi Paige! I cannot thank you enough for writing this post. Your timing is impeccable because we have a district training coming up on Shared Reading. I feel like what you have shared is giving me some background knowledge so I do not go to the training clueless and overwhelmed. Thanks a million! This is an amazing resource! We are using Lucy Calkins Untis of Study for reading and she recommends a weekly shared reading. These lessons follow her exact format. Research shows that shared reading (2 levels above a child's independent level) is the best way to grow a reader's level. I hope you are planning to make more of these, I will surely purchase them!